Strategies 360 has released a new poll that covers, among other things, the Washington state gubernatorial race between former Congressman Jay Inslee (D) and state AG Rob Mckenna (R). The poll of 500 likely voters (4.4% MOE) was taken from the 17th to the 20th of October. So, it would be worth analyzing all four of these polls together. The pooled polls gives a sample of 2,801 of which 2,558 go for one or the other candidates. 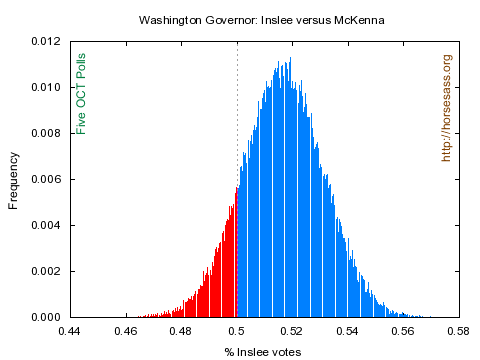 Inslee gets 1,323 (47.2%) of the “votes” and McKenna gets 1,235 (44.1%). The poll also asked people’s opinion on some topics. In looking for strategies to raise revenue to meet the Supreme Court’s ruling to better fund public education, 54% supported and 41% opposed an income tax on people making more that $200K. For capital gains tax on investment income, 47% supported the idea and 44% opposed. What people really hated was increases in state property tax, sales tax or B&O tax. Most people (59% support, 36% oppose) support an increase in state funding for higher education. All in all, this survey makes Washington state look solid blue—except for that squeaker of a gubernatorial race. So how is the polling on initiatve 1185 doing? It has passed with flying colors every other time it has been run! Thanks for the on-topic question! I-1185 was not assessed by the Strategies 360 poll. But the Washington Poll (link in the table) did assess the initiative. It found 53.6% for, and 31.2% against. Interesting, considering that not very long ago an initiative to this effect was clobbered in the voting booths. I’m not surprised that the governor’s race is tightening a bit, considering the considerable mud-slinging adds that McKenna and the Republican Governor’s Association have been throwing on TV and in our mailboxes. It’s gotten to the point that I sort our mail at the garbage can, any political mail (from either party) goes straight into the garbage can, and never makes it into the house. I’m not surprised that the governor’s race is tightening a bit, considering the considerable mud-slinging adds that McKenna and the Republican Governor’s Association have been throwing on TV and in our mailboxes. You seem to think that gubernatorial elections have not had a history of close result in this state. 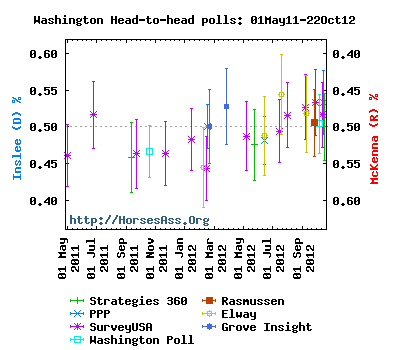 In 2008, Team Gregoire, right up until the end, expected a very, very close result, and was surprised by the length of Obama’s coattails. Those coattails do not exist this year. My feeling is that a close election (I think Inslee pulls it out unless Obama totally collapses in the final two weeks) is the norm in our current political arena unless one of the candidates is a Craswell-type. Oh. Inslee and Co. have been throwing up plenty of ads themselves. # 5: You seem to think that gubernatorial elections have not had a history of close result in this state. I don’t know what gave you that impression. That’s not what I said. I’ve been seeing the flood of political ads for the past two weeks, I was wondering if they were going to have any effect in the polls. And if I ever see another TV add which as people talking at a restaurant table, I may forego eating at restaurants again. It’s just another of the “peer pressure” tactics, which I find abhorant. @4 – The political fliers that you consider garbage was business for the print companies that made them and revenue generate from the postage to mail them to you. Jobs, jobs, jobs! Can one of you Democrats please explain why in the world the Washington Democrat Party would take $50,000 from a hater like JZ Knight? Oh? Obama was +17 in 2008. The Strategies 360 gives O+16. Even if WA only ends up at O+12, it is pretty hard to argue that Obama won’t provide a tangible, positive down ballot environment for Democrats. Your statement is either uninformed, or a very amateurish attempt at propaganda. Why is the Washington State Democrat Party taking money from nutjob JZ Knight? She is a very disgusting whatever. Can one of you right wing whackjobs please explain why in the world the Republicans would take million upon millions of dollars from haters like Sheldon Adelson and the Koch Brothers – dealers of vice and destruction of the environment?